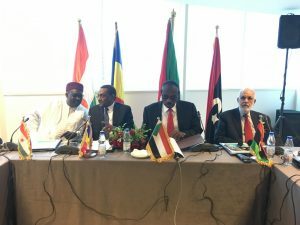 Libya, Niger, Sudan and Chad agreed in Khartoum to create a joint operations centre to strengthen border security (Photo: LANA). The Ministerial Meeting on strengthening cooperation in the area of security and control of the Libya-Niger-Sudan-Chad border was launched in Khartoum on Thursday to ratify and adopt the final report of the meetings of the Committee in charge of this dossier from the four countries concerned. The meeting is aimed at strengthening security cooperation and building security partnerships among the four countries, to unite their efforts in securing their common borders, combating terrorism, negative movements, human trafficking, the drug trade and cross-border crimes, as well as border-zone development projects. The formation of a Joint Operations Centre, which will undertake Joint operations and patrols and an agreement on judicial cooperation were also agreed. ”Our region faces challenges that we should collectively meet”, Libya’s Presidency Council / Government of National Accord (PC/GNA) Foreign Minister, Mohamed Siala said. Siala also praised support for the GNA locally and internationally, in its effort to restore peace and stability in the country. Siala went on to inform participants of the latest developments in the political situation in Libya, indicating that the Paris declaration has called for referendum on the constitution and presidential and parliamentary elections in December. He explained that the success of what has been agreed in Paris remains subject to cooperation and commitment to obligations by the Libyan parties, adding that the GNA has fulfilled all its obligations towards the electoral process by allocating the funds and providing the facilities to enable a fair and transparent elections, and is pushing to reunite the Libyan National Army. Siala said the GNA welcomes international efforts to resolve the crisis, and stressed that the efforts are integrated and consistent and that there are no differences in vision and approach. Only joint work will make tangible results on the ground, Siala added. Siala concluded by stressing Libya’s commitment to what has been agreed at the meeting as a step in the right direction, saying such commitment will positively reflect on the countries and regional environment and indeed on the southern flank of the Mediterranean. It was agreed that the Chadian capital of N’Djamena would host the Joint Operations Centre for geographical reasons, with the committee meeting within two months to bring the centre into effect. It was also agreed that the next meeting of the Ministerial Committee – the fourth – would be held in the Nigerian capital of Niamey in mid-November.